Product adoption is one of the most important aspects of your customer success strategy. Yet, being responsible for the user adoption strategy is one, if not the most, toughest assignment you can have. Particularly in the SaaS world, where early users can jump from one product to another so easily and swiftly, we want to find a way to keep our new users and avoid the leaky bucket. Our fear was that these customers’ expectations were changing. This is extra scary if you are SaaS company because it’s so easy to switch products. For us, listening to our customers and aggregating their feedback is our best tool for taking the pulse of a product. Every quarter our research team does a customer voice report where we can rank our most-requested-features stack. We can then reference them against older customer voice reports to find patterns. 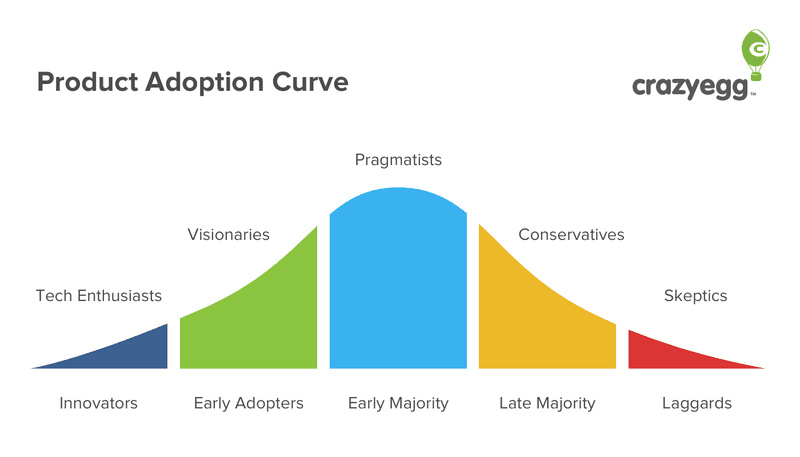 These users jumping from one product to another are usually referred to as the innovatorsand the early adopters in the product adoption curve. They are essential to getting your product off the ground, but it’s also required to understand them, their motivation and struggles in order to cross the chasm or turn your product mainstream, as it is clearly explained in this article from Crazyegg. It’s fair to say that product development is all about understanding your customers. Knowing them as good as you know yourself is crucial in order to deliver the WOW moment as fast as you can, deliver the core value of your product, shortening the time-to-value and ultimately create more customer advocates. But how do you get to know them? You talk to them, you collect customer feedback. So, without further ado, let’s get into the details of this product adoption lifecycle, what are the strategy to improve it, with a laser-focus on the power of customer feedback. First things, what is product adoption? Which metrics do we look after? It is your job to define what is the WOW moment for your product, which steps you want your users to take in order to truly adopt your product and see the full benefits of it. And the user finally adopts the product, convert, or leave it out. We will now explore the different strategies we can use to improve product adoption, with their pros and cons. When it comes to optimizing the product adoption, they are different strategies we can use in order to truly understand the customer and analyze its actions. The first step is to track the behavior of your users, but also what the adoption looks like – or, in other words, track whether the user is actually taking the steps we want him to take or not. Tools such as HeapAnalytics or MixPanel are great for that. First and foremost, for hyper-adoption of your product, your users want a sign-up process as straightforward as possible. For example, it takes under three minutes to go from being a non-user to having a Trello board up and running. There is no fluff, no mandatory step. If your product is a freemium or free trial model, when possible, I recommend removing the barrier of requiring a credit card up-front. If your product is rather technical or not easy enough, you can use a product such as Userpilot to provide optional step-by-step tutorials or guidance. Besides offering a top-notch user onboarding, you also want to constantly improve the product and its onboarding; thus, it requires actively requesting your customers’ input. You hopefully found your product-market fit, but this doesn’t mean you’ll still have it in 6 months. Users’ needs and technologies are constantly evolving, you must strive to always improve and hear from your customers. Start collecting feedback for free using Feedier, a gamified and attractive feedback tool. Depending on your development stage and where you are in your customer development strategy, you, as a CEO, or your CEO, can – and should – do things that don’t scale. Some example could be picking up the phone every time a new customer signs up to the product, or shooting a personal video for him/her. Besides this, you could also reach out on social media, or even offer your help. 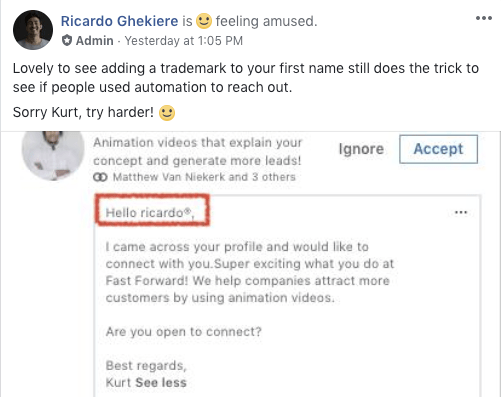 by Ricardo Ghekiere, founder of Fast Forward. That’s being said, I have also seen more advanced companies keeping up with non-scalable. For instance, Zest’s founder, Yam Regev, connect and chat with every new user. Sounds crazy? Well, it’s also the power of Zest’s community, they managed to build a family of like-minded marketers that share the same motivation: access to high-value content. It’s all about who your users are. If they are robots, then ‘do things that scale’ and ‘automate everything’. If your users are humans, by (a nice) human, make sure you digitally touch them, ask them how was their day in the office and how they celebrated Halloween. These users, who feel our genuine love and care, are telling about us to three of their colleagues. They are telling them about us and our ToV, not just about the product itself. It means that each week a few hundreds of people are taking Zest for a spin, just because we are humanizing our communication. Now, word of mouth is probably the best channel of traffic as the users who come from this channel are hyper-engaged and already well educated about the product itself. This is scale in its best. Pro tips: Scale anyone? First thing tomorrow morning, after you are reviewing your emails and performance reports, send an email to 3 of users, ask them how was your day yesterday and how does X feature is functioning for them. The point here is simple: you have to get out and talk to your customers, no matter how, but you have to experience it first-hand. Some of the most valuable feedback you can receive for product adoption is from customers who are churning, or not using your product the way you want, they have not perceived your WOW moment. Knowing why they did not take specific action or left would give you insight into what’s missing or going wrong with your processes. It can also help you hone in your target personas. Ultimately, finding patterns in why they left and solving the problems they experienced can help decrease abandonment and increase product adoption. Although it sounds simple, it is a big challenge to hear from these customers. They are not fully satisfied or didn’t find the value in your product, they are somewhat upset, and therefore, less likely to answer your questions. The solution? Asking for feedback, the right way, in a delightful way. When it comes to improving product adoption in your product, one of the most powerful things you can ever do is listen. It’s so simple but so rarely done. If you’re not using surveys to improve your onboarding, you’re missing out on a treasure trove of data that will tell you what you need to improve. You want to set a working sequence, asking for feedback when your user is likely to answer, but also by offering him or her something back. If you still haven’t heard back, you can try calling him or her. 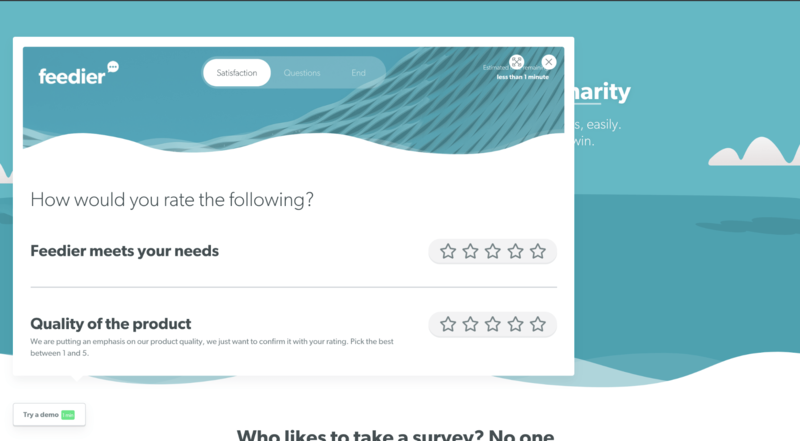 🖕Unbiased recommendation: For the survey, we recommend using Feedier, which offers built-in segmentation, widget, and email integrations, but most importantly, a reward system. There are questions you can ask in order to understand what lead your customer to sign up, and how you’re helping him. As it was explained in the first part, product adoption is not only about understanding what led the user to sign up but also about understanding how he or she is getting one with the product. There are different stages where you can request feedback in order to truly understand how your user is using your product, what would need improvement and how. On one hand, can either use a time-based scale, where you request feedback as the user progresses through the adoption of the product. On the other hand, we could also request feedback as the user gets through different levels of usage of the product. Either way, these product survey questions would aim at understanding how you could make your user’s life easier, how he or she sees the future of your app, but also how you could increase the level of involvement. Getting the onboarding right is one of the most important aspects of your product development, and it can be optimized with insights from your customers. How To Ask Better Questions And Get Into Your Customers’ Mind?